Who Manages What? Who You Going to Call? Millions of acres of public lands are managed by a few agencies. Knowing what agency is responsible for will help you when you are planning a trip or have a question. When I was in college, my mother used to try and explain to others what I was doing. As I listened to one -sided conversations, I realized that she didn’t have a clue about my career choice. I was working summers for Utah’s Division of Wildlife Resources but she routinely told people I was a forest ranger. After enough chiding, she finally posted a 3x5 cheat card next to the phone with the correct information. I thought of this as I compiled a long list of agency contacts to post on my website. I saw that her confusion was justified as there are multiple agencies that protect, regulate and manage the natural resources that Americans are so blessed with. I know my mother would have appreciated some clarification about what some of these agencies do and perhaps you would too. While there are a lot of agencies, there are just a few big players. The field of governmental resource management is divided into two categories. The first is federal agencies. 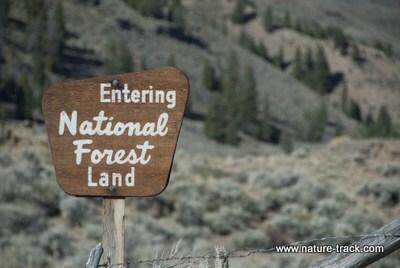 The three main federal agencies are the Forest Service, Bureau of Land Management and Fish and Wildlife Service. They are responsible for the management of most federally owned land. Fish and Wildlife Service, US Department of Interior. Formerly known as the Bureau of Biological Survey, it was renamed Fish and Wildlife Service in 1940 and moved from the Department of Agriculture to Department of Interior. They are the lead agency for enforcing federal wildlife laws such as the Lacey Act and Migratory Bird Treaty acts including managing migratory bird hunting. They are also responsible for administration of the Endangered Species Act—managing threatened and endangered species and manage the 93-million-acre refuge system in 50 states and several territories. State agencies are the other governmental category. They work within the state borders but do not have any control on the federal system. State Wildlife Agencies: The North American Wildlife Model holds that wildlife is the property of the individual states. Each state has its own wildlife management agency which manages the wildlife within its borders. In Idaho, it is the Idaho Department of Fish and Game, whose mission is to preserve, protect, perpetuate and manage all wildlife in Idaho and to promote wildlife-based recreation. Most wildlife agencies are minor land managers (IDFG manages only about 350,000 acres) but coordinate with public and private landowners. State Trust Lands: Most western states have an agency that manages trust lands—land owned by the state for the benefit of various trusts such as schools. Their job is to maximize revenue from these lands. These lands may provide recreation but are not managed for it. Idaho Department of Lands is the trust administrator here and they manage 2.4 million acres. If that is still clear as mud, let me just conclude by saying that our natural resources are in good hands. They are managed for the long-term benefit of all and open for recreational use.